Creo adopts the widely used Yoga library for advanced and dynamic layouts. This library implements flex-box a rinomated multi-platform layout engine adapted from the web world to help solving layout of complex interfaces across different screen size and idioms (ie. ios, ipad, landscape, portrait). 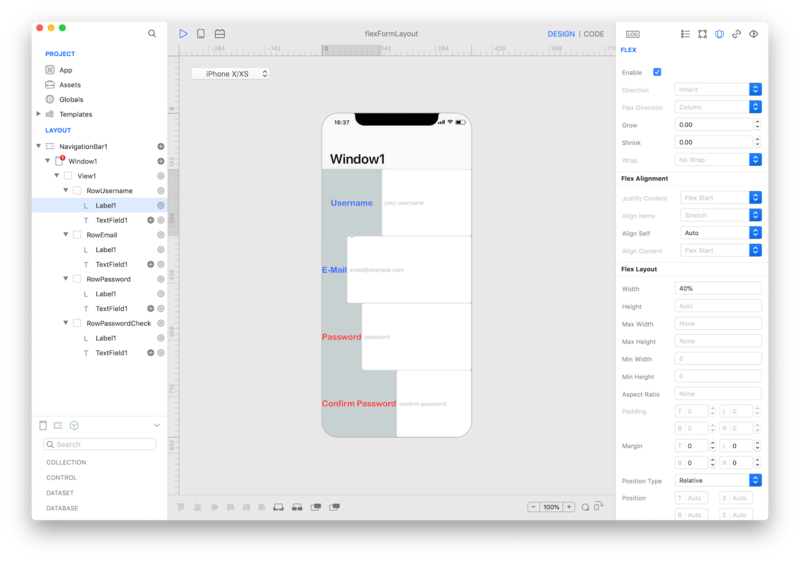 Note: in Creo the yoga engine coexistes with the iOS Autoresizing masks and nothing change for developers satisfied by the autosize layout engine. Even better, from Creo 2.x they also get supports for the safe area to properly support the new top-notch and rounded corners. The most important difference of flex (from now the abbreviation of flexbox) with the autosize mask is how you have to think about creating your interfaces. you are no longer required to think in terms of absolute dimensions and positioning, so you don't need to modify the frame of a view anymore, a flex enabled view automatically layout all its flex enabled subviews across the configured major axis (column, row, column inverted, row inverted). To use flex start by adding a top view and enabling flex on it (tap the check box from the inspector panel) and then drop your UI controls on it. By default they will be positioned along the vertical direction (column). Note: the children subviews have to be flex enabled too or by default they will keep using the autosizing mask. In general you can now have as many view you may need, they cost nothing and will help you creating outstanding layouts. a flex enabled view listen to its parent view size changes and to its own subviews hierarchy changes. When flex is in function you can re-order any view in the container and see istantly the new positioning. 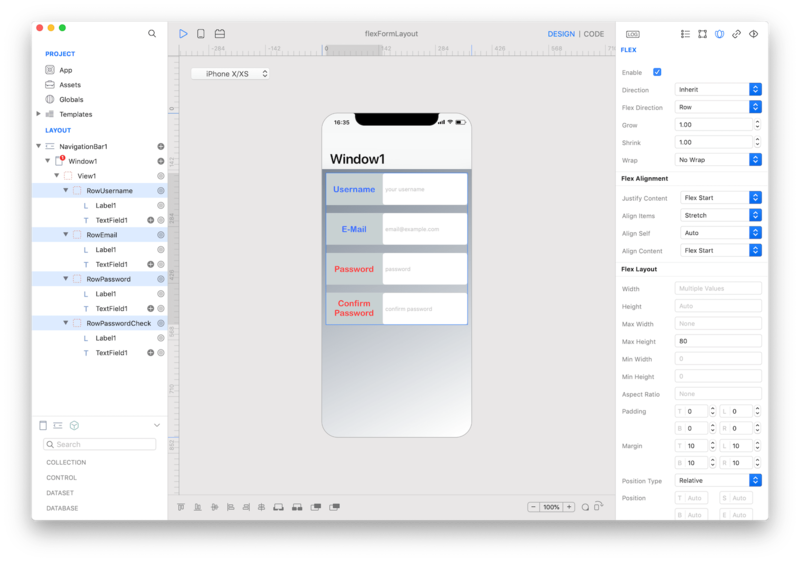 You can also modify the dimensions of the parent view or the properties of any UI control and the layout automatically will re-calculate itself to satisfy new constraints. 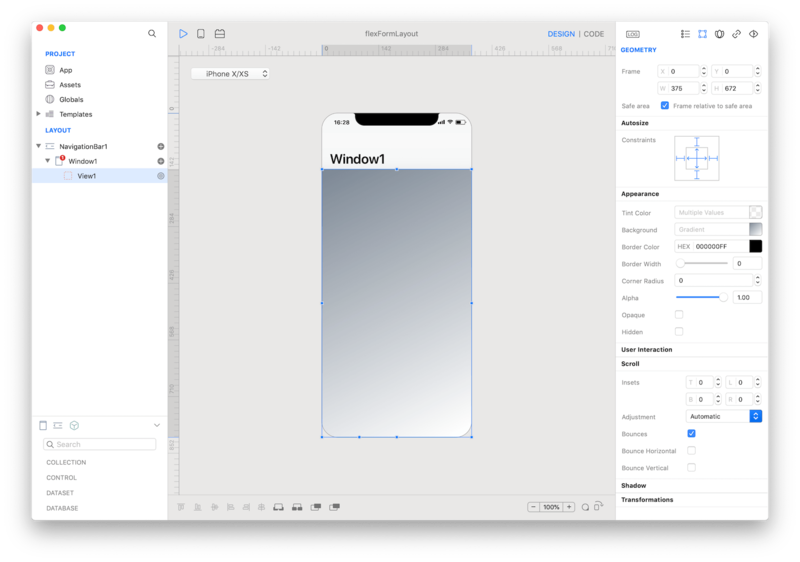 Of course this works with device rotation and safe-area too; supporting landscape and portrait can be solved by just using flex at the root view level. fixed (default) all subviews shrink or grow and eventually overflow to fit the view frame. There are no scrolling options in this case. flex the major direction becomes flexible and the subviews use as much space they are needed in that direction only. Therefore the view content size may become bigger than the frame and eventually allow the users to scroll the content. manual you enter your own values and the layout engine will use that as a reference size. In this case the content may scroll in all directions. Note: try to mix them and have scrollabe subviews inside scrollabe containers all adapting to the device screen and without a single line of code. each flex enabled view defines a list of properties in the flex inspector to controll the alignment and the layout of its childrens. Some of these properties depend on the presence of a parent view container with flex enabled, therefore not all propertiers are always enabled. When the parent view space is not big enough or is just to large to contain all its subviews the shrink and grow attributes kick-off and define how, and eventually, whats childrens get more or less spaces. Once here you can test different devices and orientations; they should just works. That's it! you have the base of form layout. If you add other views between the rows (ie a label to describe a category of fields) you can see the layout adapting.